I love piecing together a quilt it’s my favorite part of the quilting process. Designing is fun and I love binding the quilt, but watching the top coming together is the most rewarding to me. I feel a sense of accomplishment when I’ve laid the top onto the bed and think about what it will look like fully quilted. Kay and I will interrupt each others work to show our progress and chide each other with “have you taken a picture of it yet?”. This came about because while quilting at one point I was nearing completion of a quilt without having taken a single photo of it yet. There would be no way to know how it had gone together or what it had looked like while it was still in process. We both had wanted to document the process long before we started writing about it. The main reason though was to share this process with our children. We’ve been together for 16 years and have seven children between us. Yes, I said seven… though all of them are out of the house and in different states, we’re lucky enough to have frequent visits. We thought at some point a few of the children might wonder how these fantastic quilts that made it into their hands had manage to come together. This inevitably led to writing about the highs and lows, successes and challenges of making a quilt. At times we become frustrated trying out something new and having to undo it for the third time. Having those photos from the past showing where we started and how far we’ve come have really helped us stretch our ability and has driven us to try harder. Using advanced techniques makes for a more challenging quilt to be sure, but it allows us to grow in our abilities while making more elaborate works. Don’t get me wrong, there are times when putting together something less intense feels just as rewarding. I think it’s the sense of accomplishment of having completed a work of art, which is how I view all quilts… works of art. There is no machine that does all the work, just a person or three and a lot of hard work. 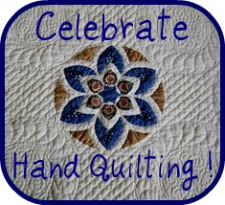 Which part of the quilting/crafting process is your favorite? Piecing is definitely my favorite part. That explains the plethora of UFOs I have! I’ll never be rid of mine ’cause even as I finish my projects up I’ll start six more! !